Hi Dava, thanks for being a member. Keep an eye on the videos for cash thread, if you're interested will be doing double money promotions from time to time. Might make it to a drone conference one day after all. Hello everybody. Just joined, total drone newb here looking to learn. Want to get it right. Found you via your twitter. Hi Dukem, nice to meet you! 8) What do you mean you want to get it right? 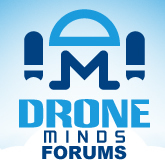 Hi DukeM, thanks for writing in the welcome thread, and welcome to drone minds. Thanks. Dava, I mean I want to fly drone well and not be on the news for doing wrong. Good for you DukeM, anything you need to know just ask. Hi all, new here and new to drones. Looking to ask questions. Hi Ragnarok, welcome to Drone Minds. My name's Simon, and I run the "On the Kitchen Table" YouTube drone channel aimed squarely at beginners/intermediates in the ready-to-fly end of the hobby, particularly DJI but also looking at Yuneec, 3DR and the other new players coming on stream. As well as trying my best to help people out with tips, product reviews, how to's, etc, I also try and promote a strong pro-safety message and, as I work in the UK, a strong pro-legal flying message too. It's called "On the Kitchen Table" because that's where I film it, and that's where I tinker with my quads - not everyone has a background in electronics and RC, nor do they have a "man cave" or workshop, but I try and show that you don't need that! I'm also not a wannabe TV star, so you don't get to see much of me in the videos - but I do try and help anyone and always remember that it wasn't so long ago that I was asking all the questions that newcomers are now. Hi Simon, you have a nice yt channel. Hey Simon! On the Kitchen Table lol, like it will take a look. Hello Simon, thank you for sharing your youtube channel. Thank you Sara, I'm glad you find it interesting and/or useful! Hi @Simon_Quads - thanks for joining the forums! Hello, Simon, great to see the likes of yourself in with us on the forum. Love your videos, well presented with some very useful tips. About turncircles; our primary focus is to increase flight time through weight reduction and overall system efficiency. We have a unique motor design that saves around 70% on weight per motor. Our motor though, has higher torque than comparable motors at the same size. Following the motor outcome, we excel a custom propeller design that best fits the motor torque and the required thrust.